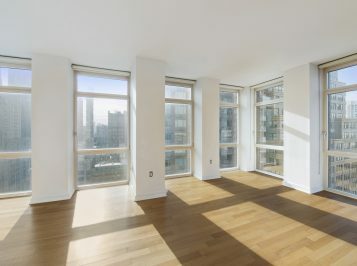 The “A” line features large floor to ceiling windows with breathtaking views from all the rooms. South, West, East & North views flooded with sun. Welcoming entrance foyer opens to a large Living room, Dining Room, and Open gourmet kitchen equipped with rich cherry cabinetry and granite counter tops. Large Master bedroom with great open views and in-suite marble window bathroom equipped with a shower and separate tub. 2nd bedroom with floor to ceiling windows facing South with full tile bathroom. Great closet space. Family room or 3rd bedroom and a large guest bathroom. The apartment has beautiful wood floor throughout, Washer, Dryer and great closet space! Sky House Condominium designed by acclaimed architect Bruce Fowle, a Full service 55 story luxury residential tower with only 3 apartments per floor, Elevators, 24hr doorman, Abigail Michael Concierge service, Fitness Center, Children Playroom. Great location, north of Union Square and Gramercy Park, east of Chelsea, the Lovely Madison Square Park, 5th Avenue are just steps from your door, and just blocks from three subway lines B, D, F,M, N, R & 6. A thriving downtown neighborhood. Showing by appointment 24 hours in advance.